Greensboro Self Storage at 3939 W. Market St. Located between W. Market St. and United St., Extra Space Storage serves residents of Greensboro. Locals will recognize our facility near Sheetz, Triad Yoga Institute, and The Art Shop south of Starmount Forest Country Club. We're also accessible for residents of nearby apartments, such as Nottingham Apartments, Morris Manor Apartments, Autumn Trace Apartments, and Campus Crossing Apartments. GREG (and Mark prior) are both excellent..."gem" employees! I would hire him! At the convergence of West Market Street and United Street. Next to Sheetz and across the street from Safari Station. Drive southwest on N Holden Rd. Pass Starmount Forest Country Club. Turn right onto Ashland Dr. Turn right onto United St. Turn right onto W Market St. Our facility is on your right, immediately after Sheetz. Drive north on S Holden Rd. Turn left onto Ashland Dr. Turn right onto United St. Turn right onto W Market St. Our facility is on your right, immediately after Sheetz. Drive west on W Market St. Pass the University of North Carolina at Greensboro. Pass Starmount Presbyterian Church. Turn Left onto S Holden Rd. Turn right onto Ashland Dr. Turn right onto United St. Turn right onto W Market St. Our facility is on your right, immediately after Sheetz. Drive east on W Market St. 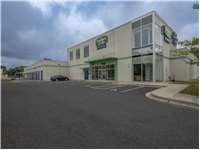 Pass United St. Our facility is immediately on your right, just beyond Sheetz and before Piedmont Global Preschool.